ZooLights runs Nov 21 to Jan 5 (with 5 dates that are closed) including 10 discounted nights. It wouldn’t be the holidays in Portland without a visit to ZooLights, the Oregon Zoo’s annual winter festival. As you walk around the zoo, you’ll see a dazzling display of more than million and a half lights, and experience your zoo in a whole new light. In addition to visiting elephants, penguins and other animals, you can ride the popular lighted train and enjoy dinner from a variety of food carts. Little ones may want to ride the carousel, and Santa will be available at the events through December 23 for photos. There will be local food carts, special warm drinks and live music as well. ZooLights runs from November 21, 2018 to January 5, 2019, though it will be *closed November 22 and December 24-25 for the holidays, and November 27-28 for BrewLights. Value Nights will take place on November 26, 29 and December 3–6 and 10–13. Zoo For All families are also welcome to attend those dates. Advance tickets are not available for Zoo For All guests. The zoo opens each day at 9:30 a.m., and ZooLights tickets are valid after 4 p.m. 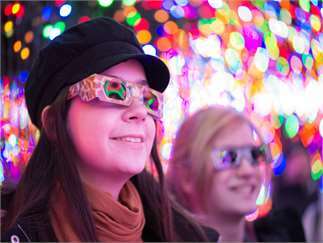 The hours are 5 p.m. to 9 p.m. on ZooLights nights, and 5 to 8 p.m. on Zoo For All and Value Nights. Grounds remain open for one hour after gates close. Oregon Zoo members get free admission throughout ZooLights. To learn about discounts for members, visit the special offers page. Members can purchase advance train tickets on the zoo's website. Cost: Adults $17.95, seniors $15.95, kids 3-11 $12.95, kids 0-2 free. Attend on Value Nights (Nov 26, 29, Dec 3, 4, 5, 6, 10, 11, 12, 13) and get $5 off admission. See oregonzoo.org/zoolights for more info.